Angel food cake originated in the United States and is basically a very light and airy sponge cake made mainly from beaten egg whites. It couldn’t be more aptly named as it certainly tastes like something angels would eat! 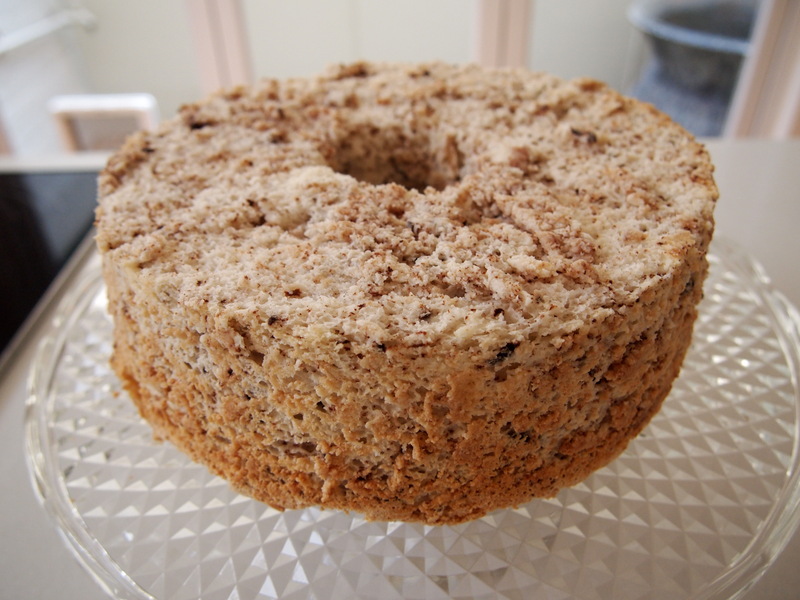 I came across angel food cake when I was trying to find a recipe that would deplete my freezer of the many many egg whites I have stored there from making ice cream, custards and sauces. Pavlova would be the obvious choice but they only really use about 4 egg whites and that wouldn’t even make a dent in my supplies. 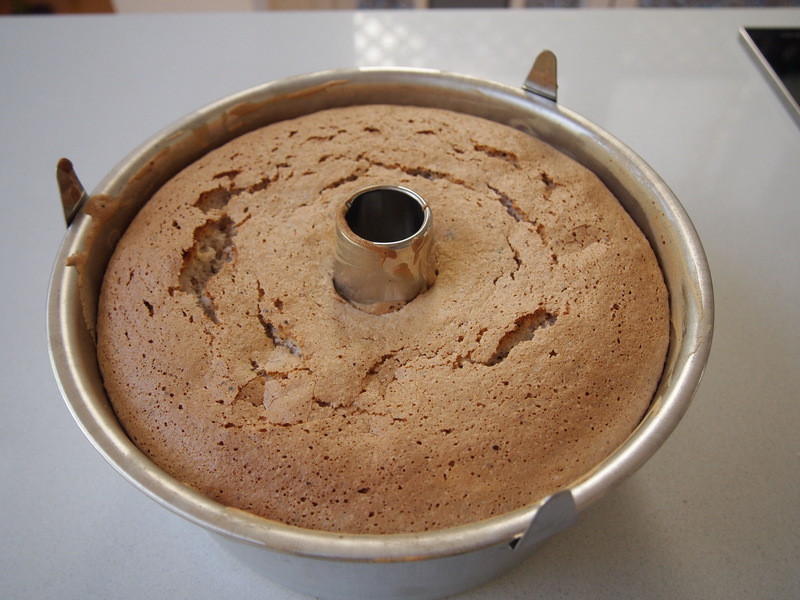 But angel food cakes use a dozen egg whites, yes a whole dozen – perfect! This particular recipe is from Ina Garten and incorporates grated dark chocolate, hence the black and white reference. It’s also topped with a chocolate ganache icing which is heavenly too. 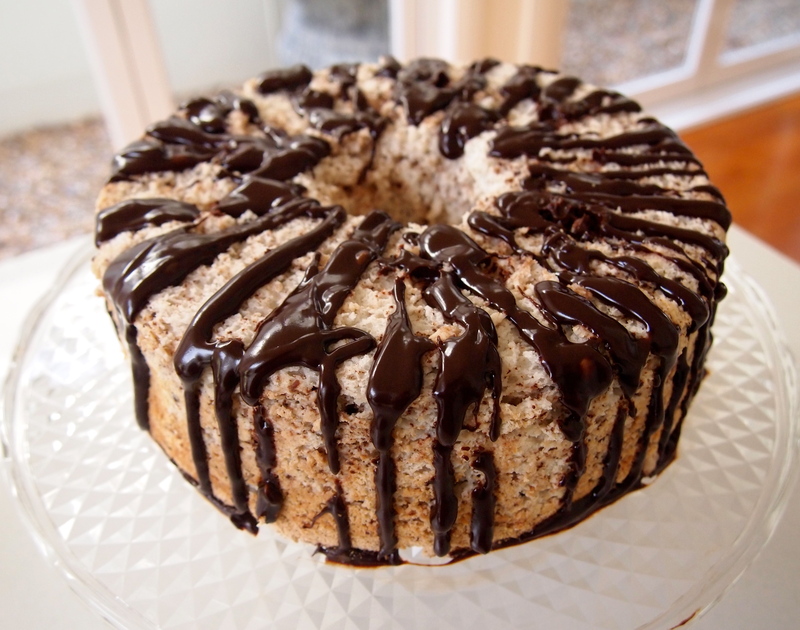 You don’t need to necessarily include the chocolate if you don’t want to – most angel food cakes are made plain with maybe some grated lemon or vanilla extract as the only flavourings. As an alternative topping to the ganache you can just spread over whipped cream or make a berry sauce. Angel food cakes are easy to make as long as you don’t have to whip the egg whites by hand. You also need to bake it in a tube tin. 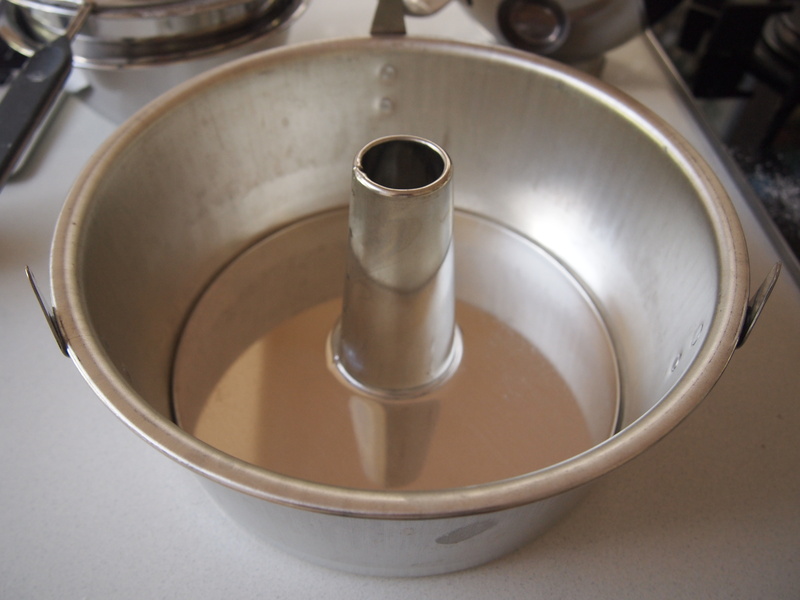 Tube tins are made specifically for this kind of cake and can be purchased from any good kitchenware shop. They are metal and not coated with any tefal or non stick coating, otherwise the egg whites won’t rise and in keeping with that same principle you should never grease the pan. This is a lovely light dessert and perfect after a heavy meal or on a hot day and if you have diet conscious guests they’ll be pleased to know that it contains no fat (other than the little in the chocolate, but as I said above, you can leave that out). You’ll definitely feel virtuous making this cake- you not only use up leftovers that would normally be thrown away but it’s healthy too! Preheat the oven to 180C – not fan forced. Combine ½ cup of the sugar with the flour and sift them together 4 times. Set aside. 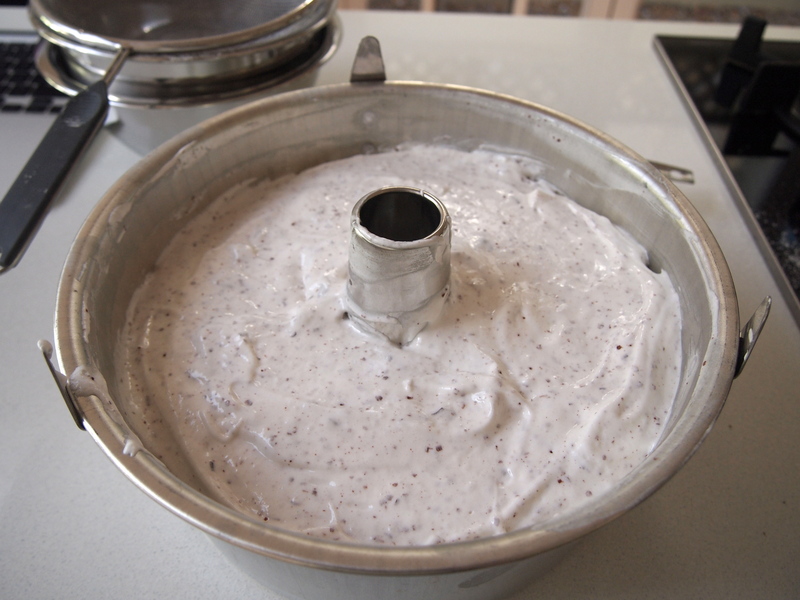 Place the egg whites, salt, and cream of tartar in the bowl of an electric mixer fitted with the whisk attachment and beat on high speed until the eggs form medium-firm peaks, about 2 minutes. With the mixer on medium speed, add the remaining 1½ cups of sugar by sprinkling it over the beaten egg whites. Beat on high speed until thick and shiny. 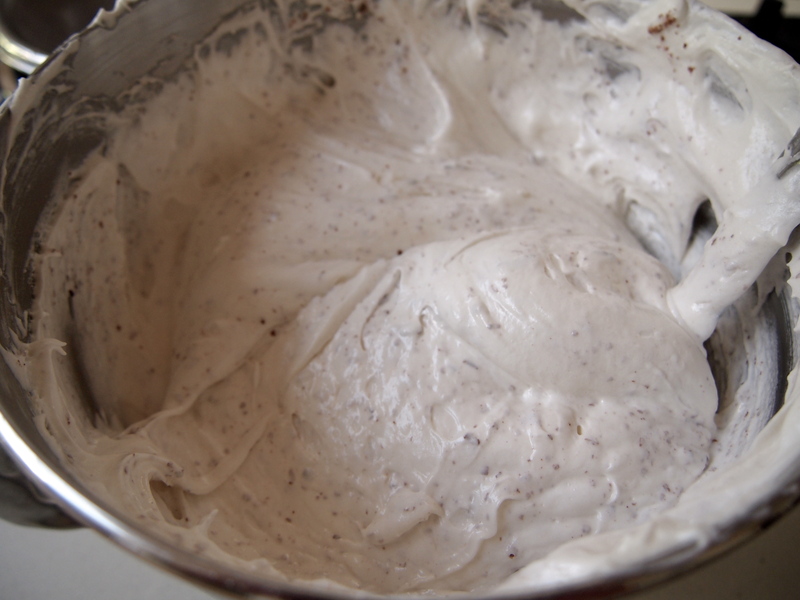 Add the vanilla and continue to whisk until very thick, about 1 more minute. Scrape the beaten egg whites into a large bowl. 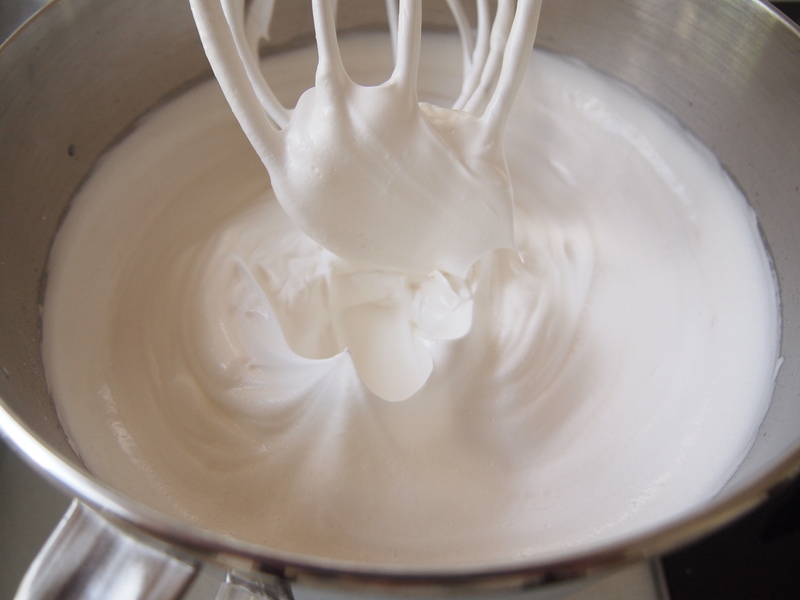 Sift quarter of the flour mixture over the egg whites and fold it very carefully into the batter with a rubber spatula. Continue adding the flour in 3 equal additions, sifting and folding until it’s all incorporated. Fold in the grated chocolate. For the chocolate glaze, place the chocolate and the heavy cream in a heat-proof bowl over a pan of simmering water and stir until the chocolate melts. 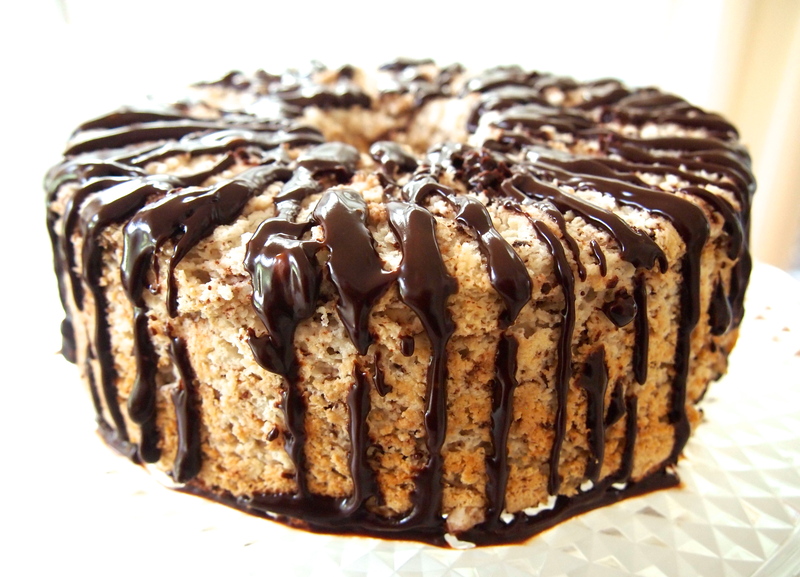 drizzle the chocolate over the top of the cooled cake and allow it to drizzle down the sides.